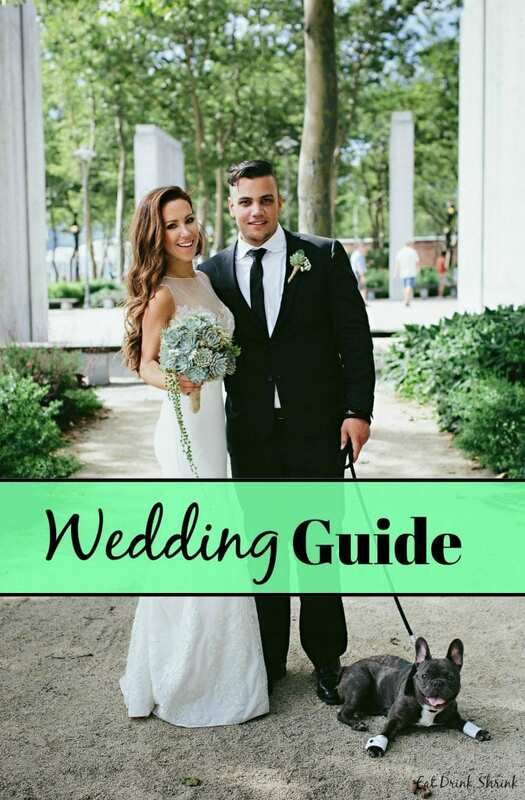 Summer Wedding Guide 2017 - Eat. Drink. 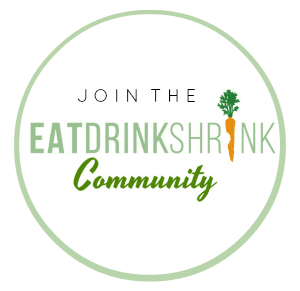 Shrink. I recently had my wedding, well, it was in late June lol, but believe me when I tell you.. Weddings completely wipe you out! I’m STILL just getting back to my routine, which took weeks. From the planning over the duration of a year, to having the belief that I could take it on sans wedding planner, managing Eat Drink Shrink while still taking an online course part of the year.. it was perhaps the longest 12 months of my life lol. Simultaneously, it was so wonderful to share a day with friends and family to celebrate a new chapter after 8 years. 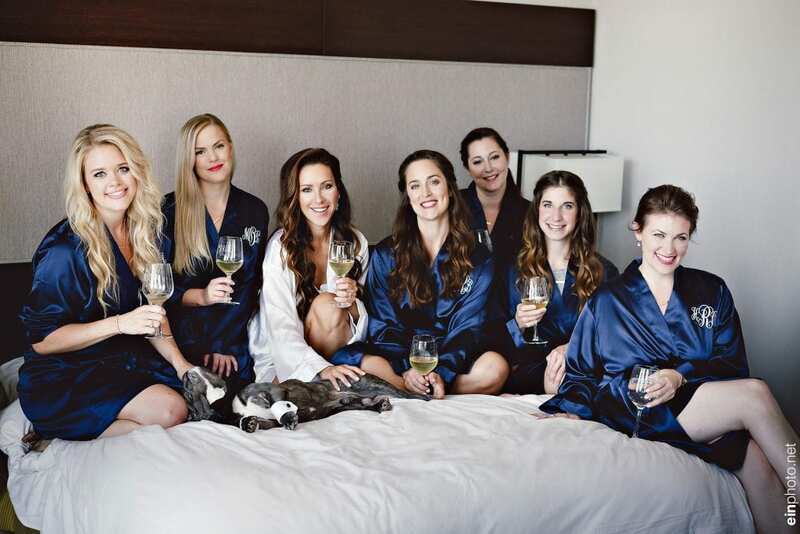 I made sure to personalize or wedding through and through from monograms to music, and of course giving our guests and bridal party items we love from companies we support. I personally make an objective at every opportunity to support small businesses. From Etsy shops to startups, it’s a great way to do your part to enable those companies to thrive in a world that’s sadly dominated by a handful of companies. Below is a list of some of the companies I used for various aspects of our wedding to make our day special. Find company links and my thoughts below! Our puppy Burt was in the wedding, and actually hung out the entire day from getting ready to nearly midnight. It was by far my favorite part of the wedding. 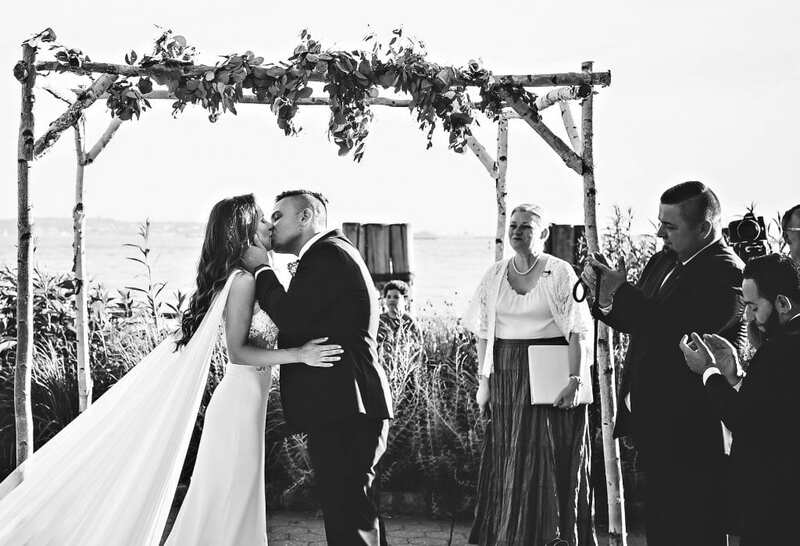 We got married at sunset while facing the water in view of the Statue of Liberty and had balconies overlooking the water during the reception. I knew my dress was the one as it had a cape! Perhaps the cost of 4 Chanel bags, it was the only dress that stood out to me. 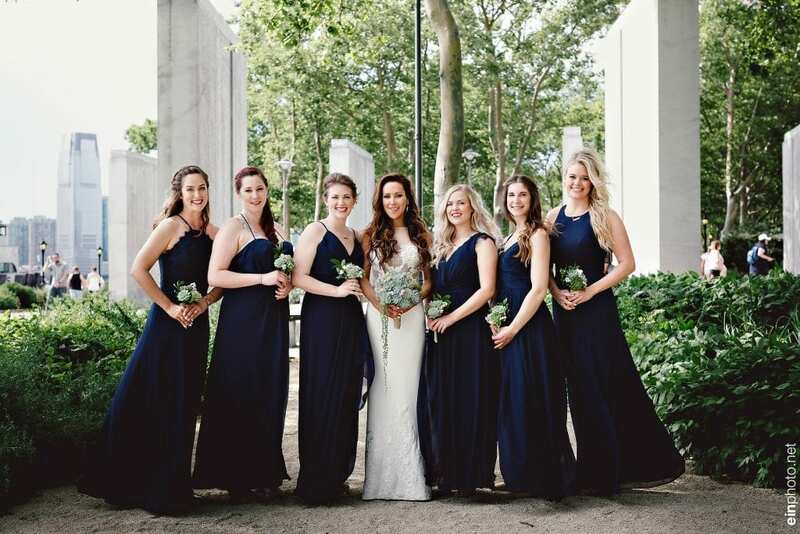 My beautiful bridesmaids wore Hailey Paige. I love her designs and the fact that she is a young entrepreneur from NYC. Her designs are classic yet modern and I admire her approach to fashion. I picked succulents for the ENTIRE wedding as I find them to be more sustainable versus traditional flowers as you can replant them! We picked an amazing videographer and spent out as I find that it’s almost more imperative than anything else on your wedding day. To be able to capture a day and relive it, is just, priceless. I had an aisle runner made, highly recommend, but our venue threw ours away when I actually wanted to keep it and remove the monogram to frame it! We walked down the aisle to Lissie “pursuit of happiness” (his pick), walked back to “Then he kissed me” by the Crystals, and our first dance song was Etta James “At Last”. If I could do it all over again I would have relaxed prior to those two hectic days. I was running from appointment to appointment and by the end of the wedding, I was running on fumes. However, it was a magical day! More images to come! My name is Maggie and I started my Etsy Shop BackZeroDesign a few months ago. Personalized jewelry have always been a passion and hobby for me. Through advice from friends, I finally opened up BackZeroDesign. I love to support handmade items because I know the care and hard work that goes into the final product. 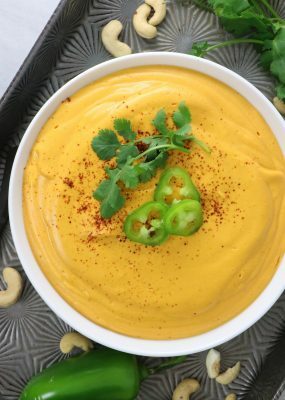 For that reason, all of my products are 100% handmade and can be customized to your unique taste. Message me if you’d like a certain item customized or if you just want to show your support for my shop! 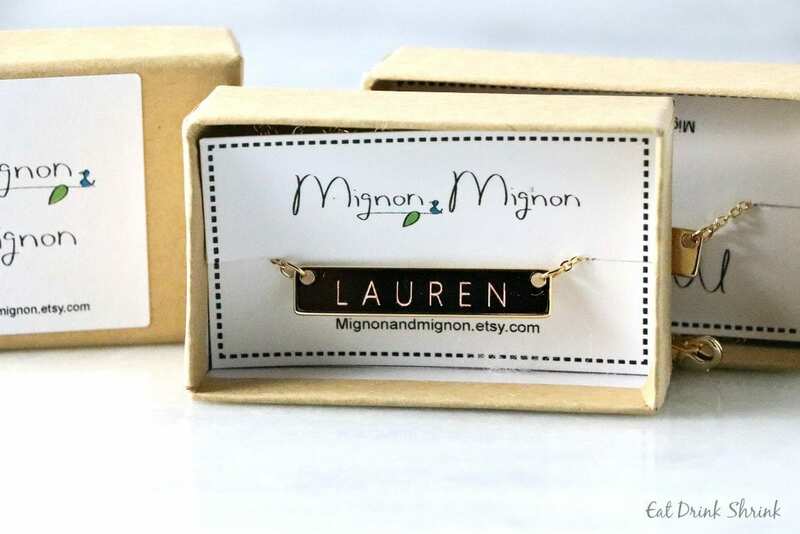 Review: For one of my husbands gifts I of course envisioned personalizing something! Gifting an item he could wear during and post wedding was the perfect choice. This cufflink and tie clip set added a personal touch to our day and we’ll be reminded of it afterwards when he wears them! The pieces were the perfect size, flawless, and had a great price point. Highly recommend! As our shop name suggests, Mignon and Mignon is dedicated to bringing you a cute, delicate, elegant style that is perfect for any occasion. The Mignon and Mignon staff has always loved discovering the beauty in simple things, and it brings us great joy to be able to provide simply beautiful jewelry to our customers. We specialize in hand stamped bars, charms, and pendants that come in a variety of finishes including gold, rose-gold, and silver. 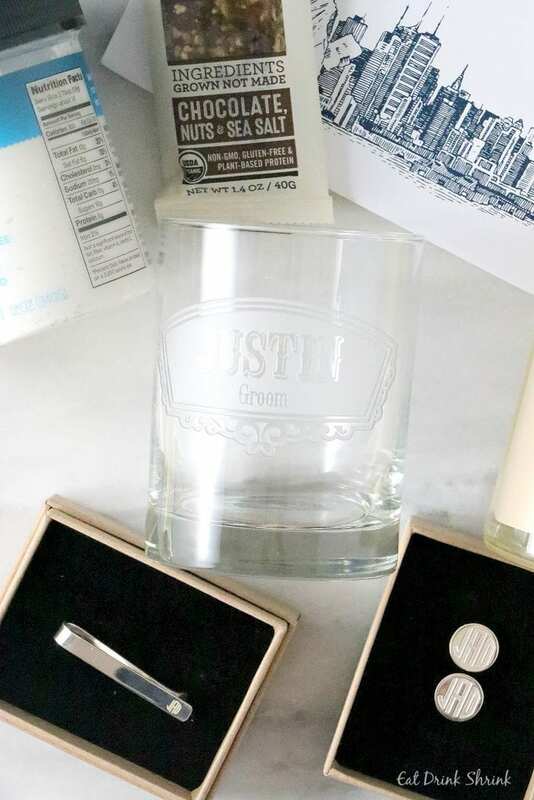 Our items are dainty, simple, and can be personalized with names, initials and special messages, making them perfect gifts for your loved ones. With such variety at hand, you are bound to find something special for yourself or to find something that the intended wearer is sure to treasure! 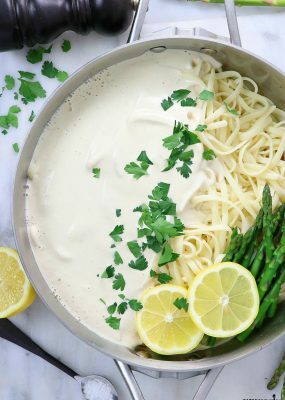 Here at Mignon and Mignon, we believe that it is of the utmost importance to ensure that our customers are satisfied with the products they purchase from us. Our top goal is to provide excellence in customer service and products! As such, we work with you in a collaborative effort to create personalized pieces that are unique and have a special meaning to you. If you have any questions that we have not already answered in our policies, please let us know! We look forward to making you something special. Thank you for shopping with us, and enjoy! 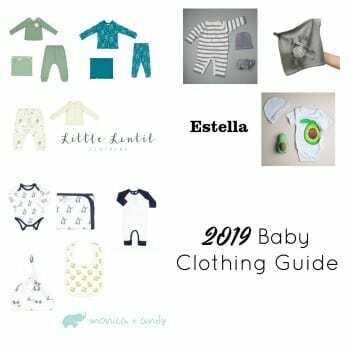 Review: While thinking of the perfect classic gift for my girls I was stumped on what I should go with. After little thought I chose to design something simple, but sentimental and went with classic name necklaces and had the coordinates of where I met each of them inscribed on the back. The items were priced wonderful, made well, and came out flawless. I thought these were so fun and such a good choice! Almost all of the brides wore the necklace for the wedding! Do what you love and love what you do. 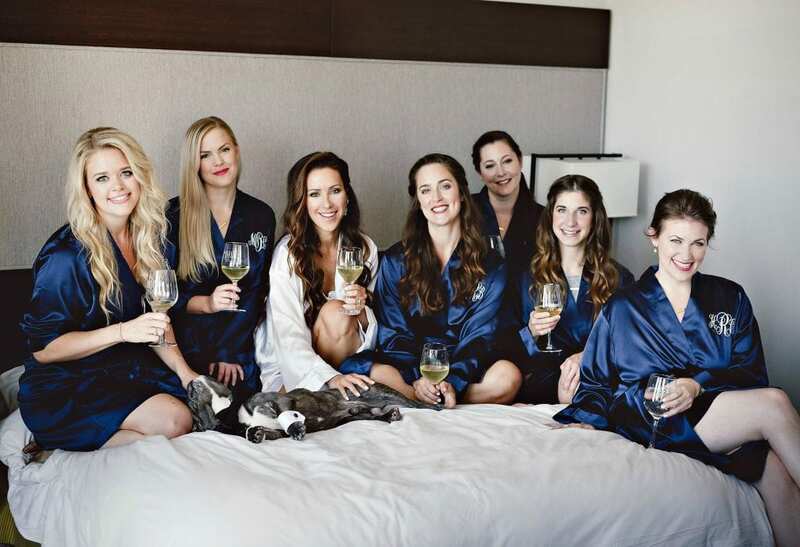 I embroider robes to make your wedding (and every) day special! Many of my pieces make great gifts for special holidays and events…specifically, Mother’s Day, Graduation, Wedding Showers, Bachelor Parties, the list goes on and on. The Fancy Pigeon was born in December 2011, shortly after our latest family additions. I love making gifts for my friends and family. Naturally, the next expansion was to “open up shop” with my favorite online marketplace…Etsy. 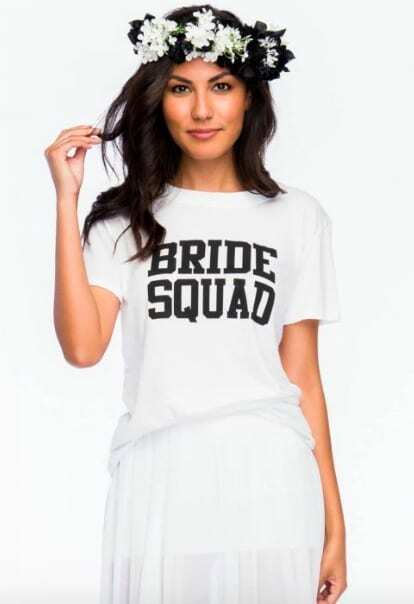 Review: I know the whole bridesmaids in robes thing has been overdone, but I love the idea of everyone looking uniform in the same color as the wedding, and I wasn’t crazy about other options such as florals or button down shirts etc. Ordering robes can also be iffy as you can’t gauge the quality of them until you physically receive it. However, these robes were very well made, the shade was wonderful, the monogram stitching perf, and they truly captured the prepping portion images. I’d say the fitting the sleeves was kimono style and they came to above the knee. They arrive packaged and have to be ironed! God bless my bridesmaids who took the time to iron them for everyone at the last minute. In 2006, two guys were wondering why they were spending their lives stuck in tiny cubicles. They were sick and tired of following “the rules.” They weren’t sure who made the rules in the first place. So they made a change. They quit their corporate jobs. They created their own brand. Nathan Koach and Jason Reed, the company’s co-founders, were inspired by the creativity of their unique group of friends in Venice, California. Among others these friends included the creators and stars of It’s Always Sunny in Philadelphia, and the group found a shared sense of humor and appreciation of the absurd, which reflects in the designs. 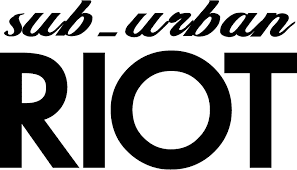 Review: I’ve been a huge supporter of Suburban Riot designs for years as he makes the comfiest and funniest apparel that’s also seen in Always Sunny! He recently released wedding designs and I jumped at the chance to give them to my girls on our wedding day. If you’re looking for the perfect humorous wedding or everyday shirt, pants, hoodie and more, I highly recommend his company! 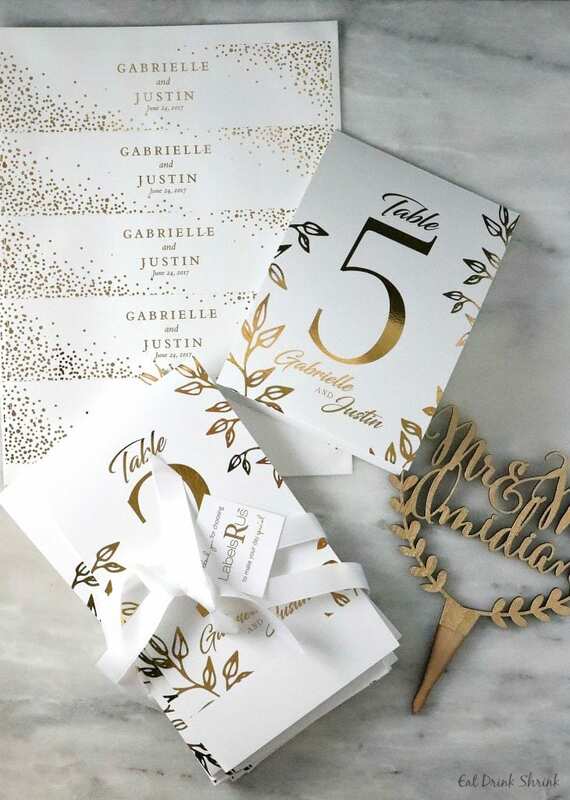 Review: While one may overlook table numbers, I was on a hunt to find the perfect ones that just made sense! Our venue had ones we could utilize, but of course they were plain, boring, and they weren’t the right colors. I opted to seek out my own! Instead of picking an option that was carved out of wood or a gold, I opted for a personalized reusable choice and purchased gold holders. I found the table numbers to be no fuss, made well, and all could be reused again. Being that they are flat, they could also easily be saved to go into an album versus the traditional options. While browsing I came across water labels as well. I know I know, it’s taking personalization next level when you even do your own water bottle labels, but it was such a nice added touch! Looking back I feel as though I may have gone overboard with peeling hundreds of labels, but it was all for a good cause lol. I highly recommend this shop for all your personalization needs! 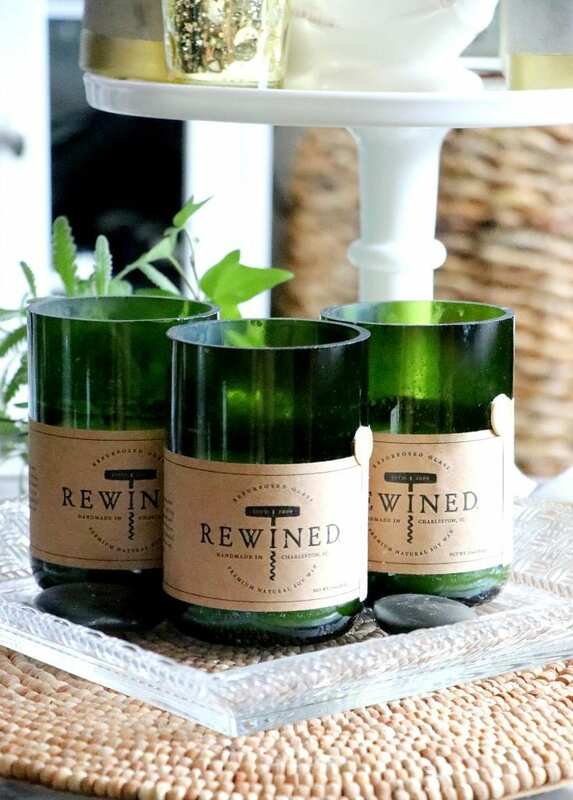 Rewined crafts beautifully designed and functional products. Our passion lies in exploring wine and places with good people. With gratitude, our story continues to grow because of our team that inspires one another to celebrate our individual strengths. Review: I’ve been in love with this company since I discovered them in 2012! Their candles are made from repurposed wine bottles, are huge, and come in an array of aromas that will complement any day. When creating the perfect day, I knew I had to feature their candles as guests would love them. Champagne is my favorite! 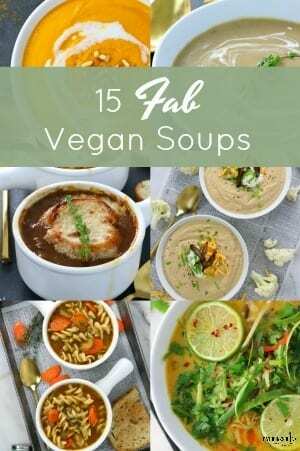 If you’re not familiar with them, I highly recommend checking them out! EO® STANDS FOR ESSENTIAL OILS. THEY ARE THE HEART AND SOUL OF EVERYTHING WE CREATE. Essential oils and creative collaboration are how our story begins, and how our company is defined. At the core of our company culture is our dedication to the collective work of like minded people working towards a common goal: beautiful, healthy body care.This is where we tell our story, introduce our fearless leaders, and talk about our values. Have fun discovering our incredible company. If you don’t find something you’re looking for, just ask! Review:: I love EO products! 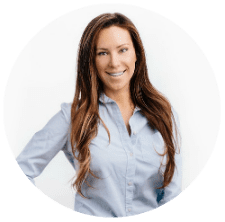 They are accessible, affordable, non toxic, and they’ve evolved to offer an array of products today that encompasses just about everything. I chose to use their products in our bathrooms and it was just a no brainer. 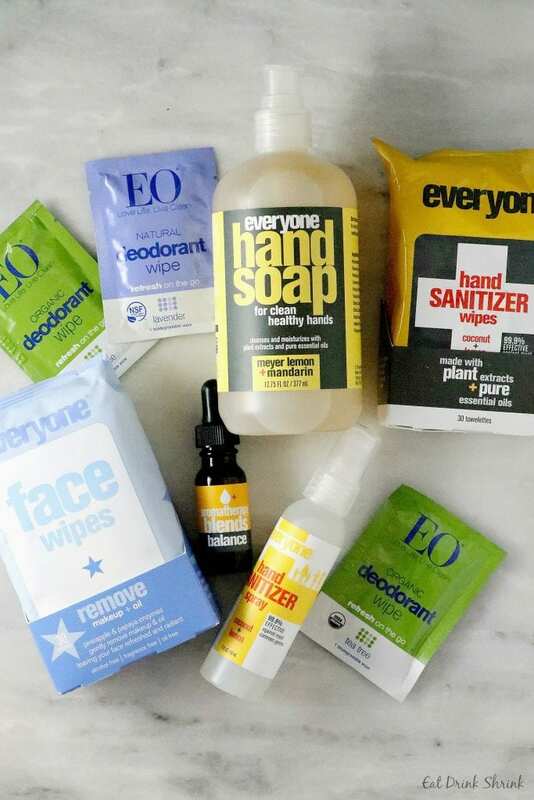 From essential oils, hand sanitizers, to even natural deodorant wipes, we had it all! I highly recommend their products to offer your guests non toxic items on your day. Working with my hands has always been my favorite thing to do…from employment to hobbies, and now Etsy. I’m an ASE Master Certified Auto Mechanic that retired after 9 years to stay home and start a family. Now we have 2 beautiful little girls and life really couldn’t be better. My AWESOME husband provides so much for our family. I’m so grateful! A few Christmas’s ago I bought my husband all the equipment he needed to start brewing his own beer. It didn’t take long for it to become a serious hobby. We’ve been avidly brewing ever since. Now we have 3 favorite recipes and working on number 4. In the summer of 2011 I had the idea of making a set of custom pint glasses with our home brew name on them. That escalated to researching how to make them myself, which turned into an awesome set of glasses all our friends loved. “You should sell those” kept being repeated so I decided to give it a try. 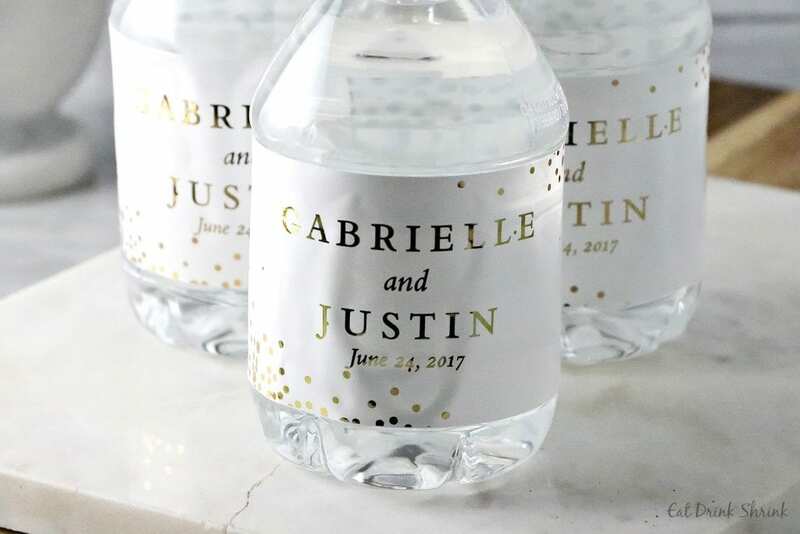 Review: To further personalize the moment I wanted everyone to have their own monogrammed wine glasses! When prepping for the day the majority want to indulge in a glass of wine or champagne and so these glasses were the perfect fit! I would only recommend purchasing early in case that one arrives broken. The owner was quick to remedy that issue and ship another one which was wonderful! I highly recommend these to enhance pictures and add a personal touch! 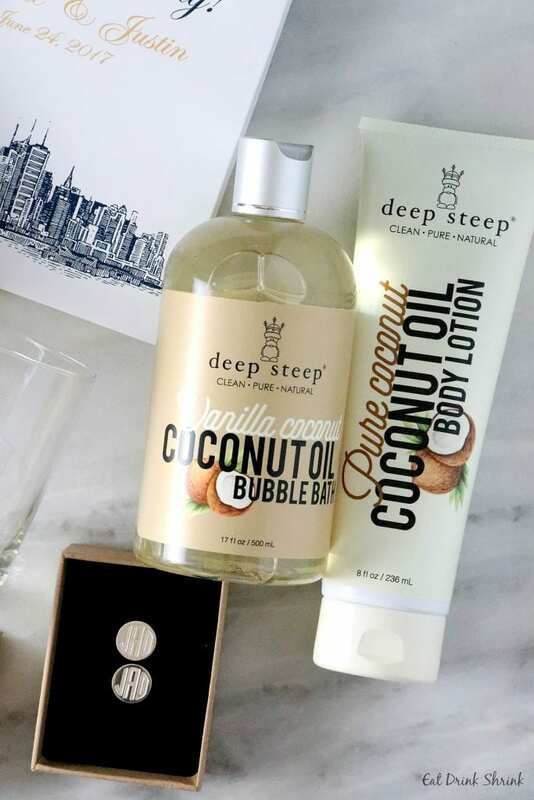 Deep Steep: This natural bath and body company is one that has boomed over the years and I’ve grown to love them more and more. I reviewed their products back in 2012 and since then have seen their line evolve to become more and more diverse offering every scent under the sun at a prices that are very competitive, especially in the world of natural products! 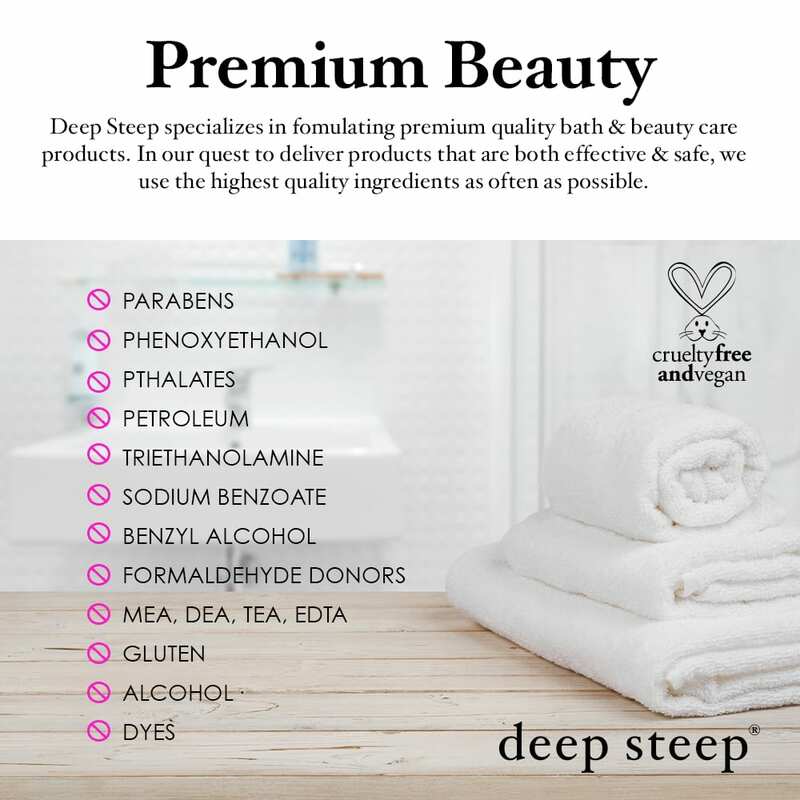 When brainstorming about the another essential item to gift my gals, I instantly thought, bath products and new I had to share my love for Deep Steep! I selected bath bubbles and lotion in coconut, which is perf for summer! Deep Steep is accessible, affordable, offers every scent under the sun and the aromas are not overwhelming. I highly recommend them! 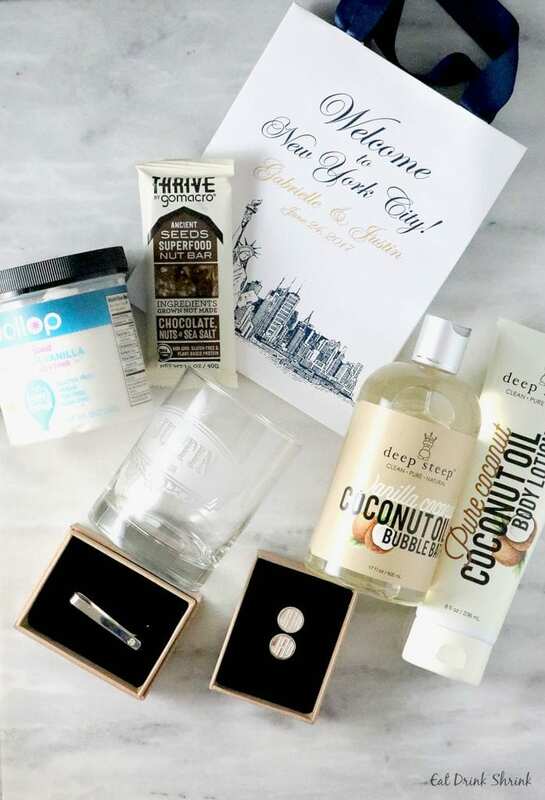 Review: As a green beauty enthusiast who’s sampled upwards of 100 different companies and countless products, I wanted to share with my bridal crew the perfect travel kits for the wedding weekend! While many don’t waste their time with them, I personally love kits! They offer a great selection of products, come in the perfect size, with the perfect bag, and enable you to better gauge if the products will ultimately work for your skin without breaking the bank. 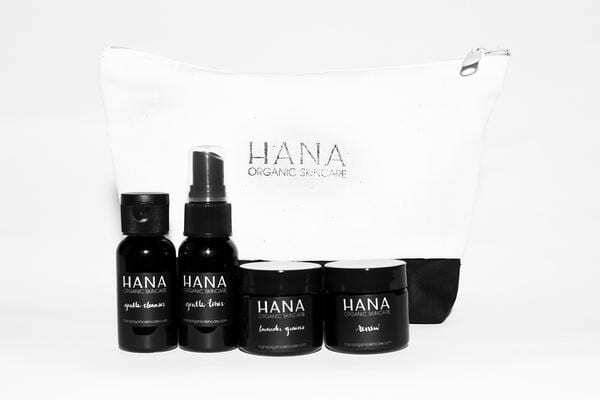 I personally had my eye on Hana skincare for a while and was hoping to get the chance to try their products. 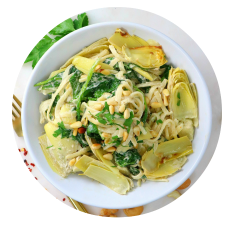 I love the packaging, the simplicity in the ingredients, and the products work! Our Essential Travel Kit is a must for that long vacation, a weekend getaway, or last-minute overnight trip. It’s also a great way to introduce yourself to our products! I am a professional designer and creator of wedding décor studio in wonderful Kyiv city, Ukraine. I live in Kyiv with my husband and our three sons. I like to create beauty (wonderful mood or beautiful picture) that brings gladness and makes people happy. My aim is making so that my clients got exactly that they wanted and dreamed, individually, stylishly and qualitatively. I like to create individual orders and combine different colors, materials and textures, and also different ways of printing and handwork so much. Creating new collections I make that would like to have for myself, what will be pleasantly to take in hands, on what will be pleasant to look and examine and delight in details. Review: I’m sure the last thing on someones mind with orchestrating a wedding is the hotel gift bag for your guests. Not what goes into it, but the actual bag itself lol. However, I was actually excited to find really nice bags that coordinated with our wedding colors and of course, was personalized! I happened to find this company on Etsy and was thrilled with the quality of the bags and the experience working with her. Although the bags I received were smaller than I envisioned, they fit tons of items for guests with no problem! (except for perhaps the wine bottle lol) I truly love her creations and they were made so well. Highly recommend! My name is Emily, I’m a native Oregonian, living in Portland, OR. Some of my favorite things include sushi, animals, exploring the beautiful Pacific Northwest, and the sun (although it comes our rarely here in Oregon). I moved to Portland from my hometown after I graduated from Oregon State University with a degree in Interior Design. I’ve always been passionate about all things creative, and have had a blast working with Photoshop, watercolor and creative lettering. I can’t wait to share that with you all! 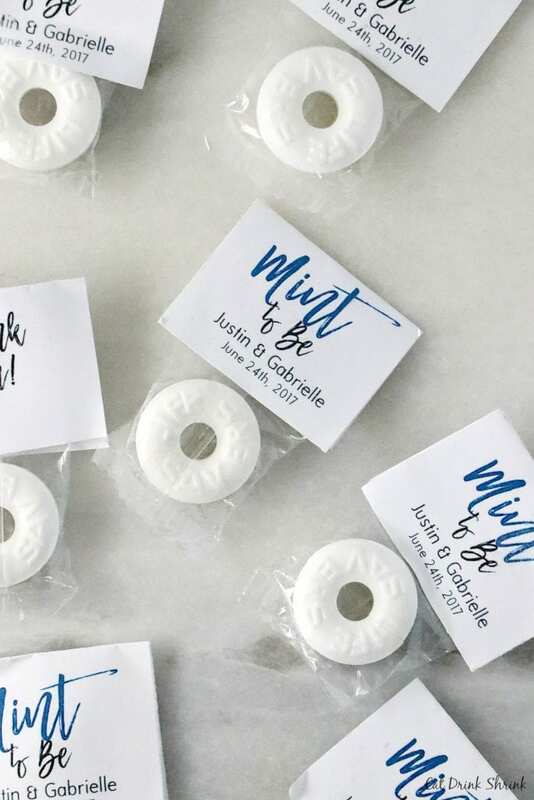 Review: Instead of packing gift bags full of natural gums that are always terrible I decided to opt for a classic mint and of course, personalize it! I love the fact that these arrived labeled and ready to go versus many other items where you have to manually put things together. The labels also prevented the mints from getting lost in the bag and added a personalized touch that I always go for! Highly recommended! 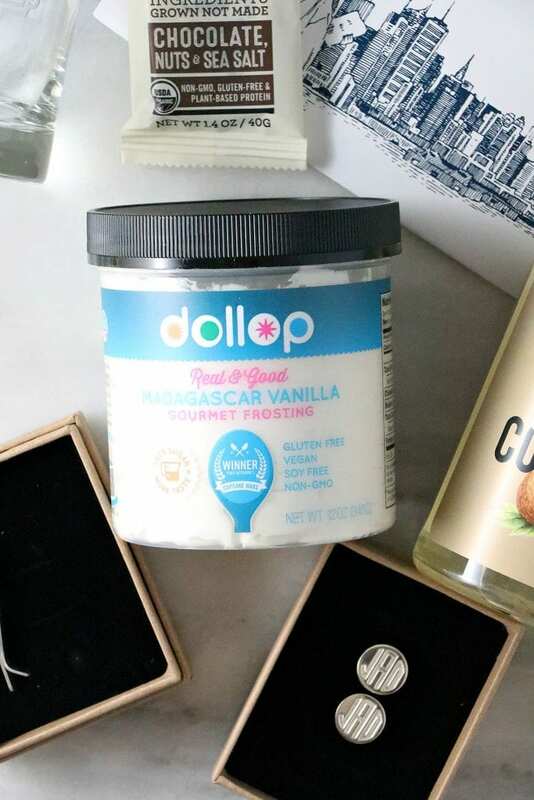 Review: Where do I begin with Dollop Gourmet! 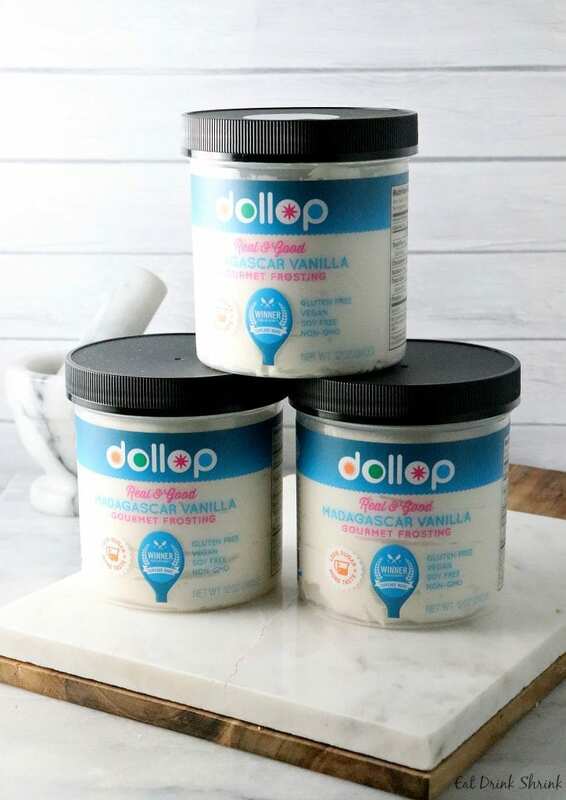 I discovered this shelf stable vegan icing company years ago that was founded by a women who survived Shark Tank. Needless to say, I was instantly in love with everything about this! 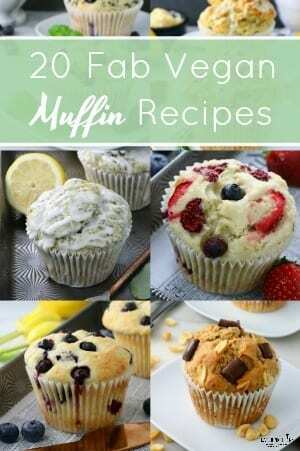 A women who pioneered a pre-made vegan icing that comes in an array of flavors! 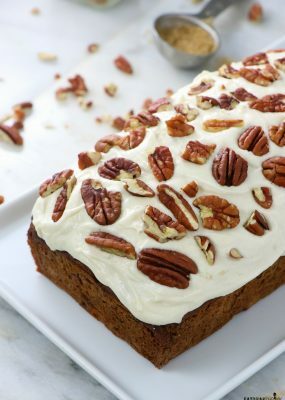 Her products are so good, they can be enjoyed on a cake, cupcake, brownie, a piece of fruit or simply enjoyed on a spoon. 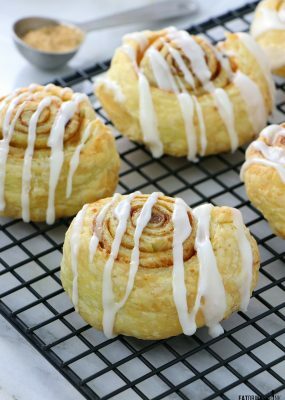 From a distance, giving guests vegan icing seemed obscure perhaps to some lol. However, if you know how good Heather’s product is, it make perfect since! 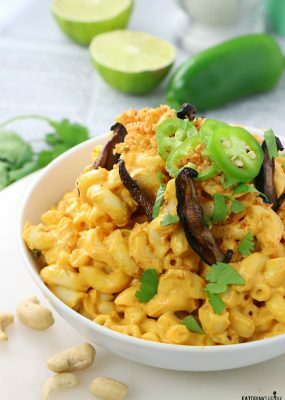 Everly: If you were born in the late 80’s or early 90’s, then this recipe is for you! 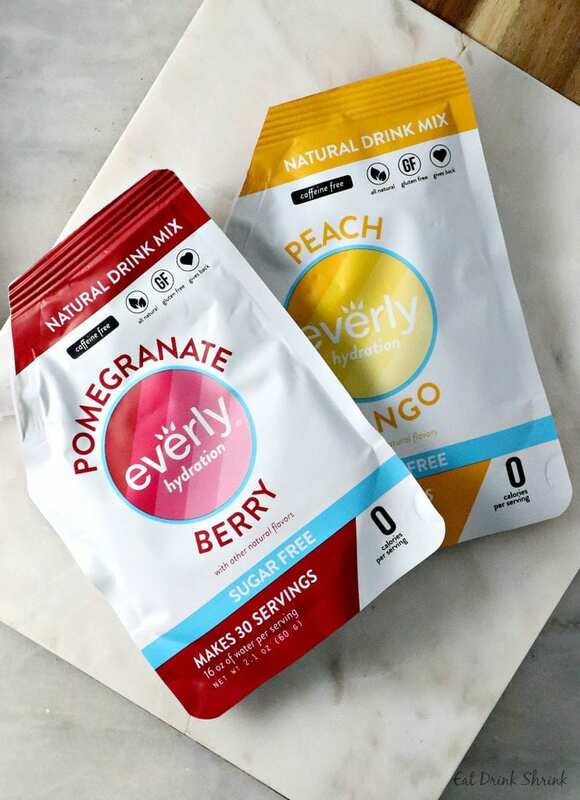 I’ve been familiar with the Everly drink powders since circa 2012. 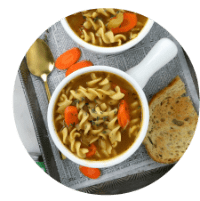 While they’ve evolved to offer larger packets to make the process more seamless and created an array of new flavors, the product is always accountable to provide great flavor and influence me more to get my daily water intake. 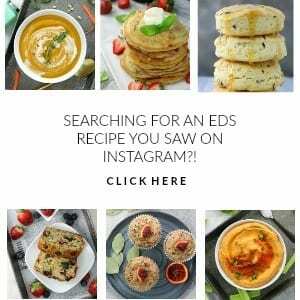 Since I experienced the boom of the dreaded “Crystal Light” product that’s packed with lord knows what, I was head over heals since day one when I first became acquainted with Everly. Having many potential dehydrated wedding guests seemed like a bad scenario in late June, so I decided to feature these in our gift bags! Best decision I ever made! 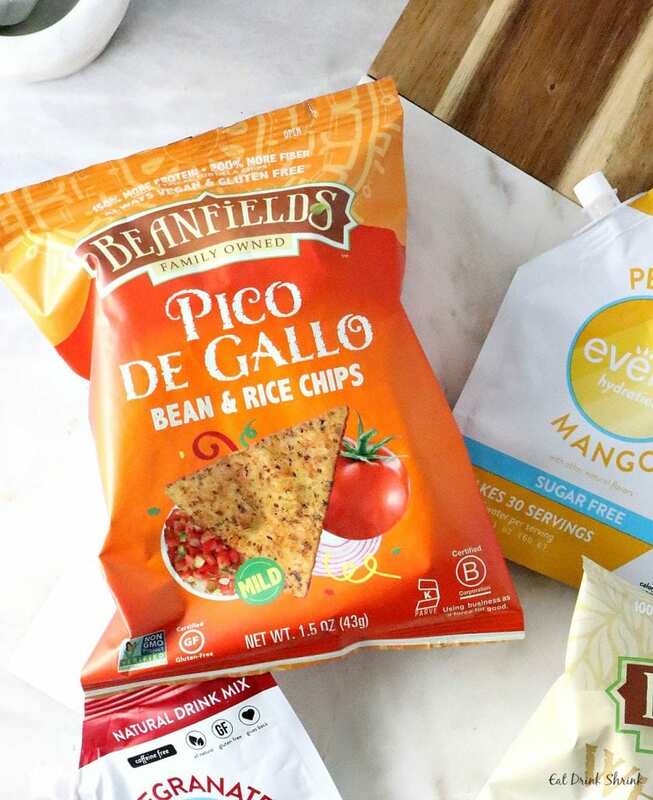 Review: Beanfields chips have been around for what seems like forever and since day one, I’ve been completely enamored with their products. 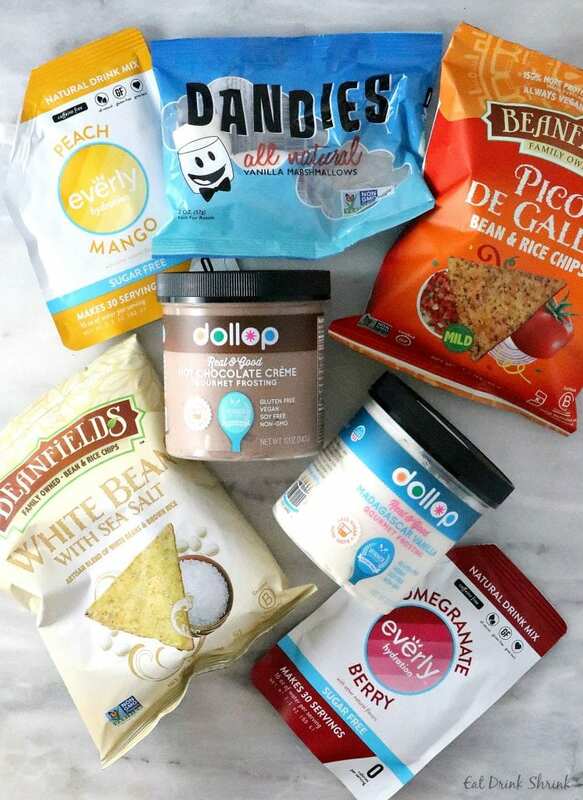 All their chips are made from beans, they offer tons of flavors, all are vegan (99.9% sure) and you can taste the difference in their products that packs less calories than your standard run of the mill tortilla chips. When brainstorming about the perfect savory bite to include in our guest bags, I knew these would be a hit! I’ve been familiar with GoMacro bars for as long as I can remember, however, I never had one until our wedding! 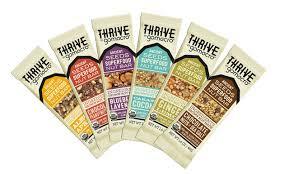 This company specializes in organic unprocessed health bars that come in an array of fun flavors. I personally gravitate away from any bars unless I’m in a bind. 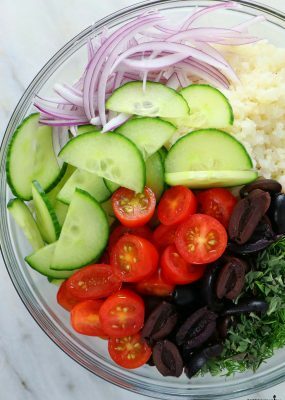 However, with a wedding in full swing I thought it would be a nice addition for guests to have a quick nutrient dense snack if feeling sluggish over the weekend. 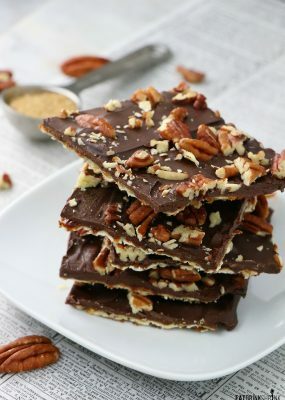 I loved the Nut Bars as they weren’t the texture of your typical bar and I found them to be quite filling, versus others that just run right through you leaving you hungry again. These bars were the perfect choice! 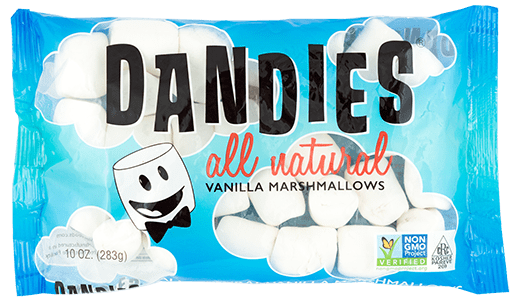 If there is one fun vegan product that never gets old, it’s vegan marshmallows! The company was so gracious to send a myriad of small packs that that fit seamlessly into guest bags. 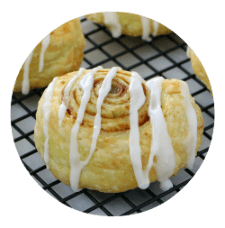 A nostalgic classic treat was the prefect choice! Dandies Marshmallows are perfect for roasting over the campfire or making s’mores. 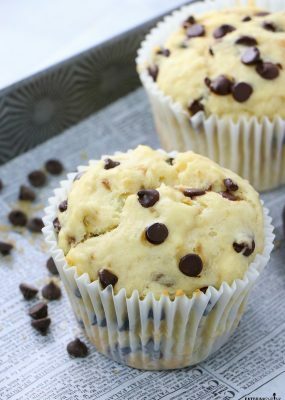 They’re also fantastic for classic crispy treats.